Investors giving their money to an active manager need to be confident that the manager is taking enough, but not excessive risk to achieve the targeted returns. They don’t want a closet indexer who hugs the benchmark but charges active management fees. A suitable level of tracking error (“TE”) ensures that goal, right? Wrong! 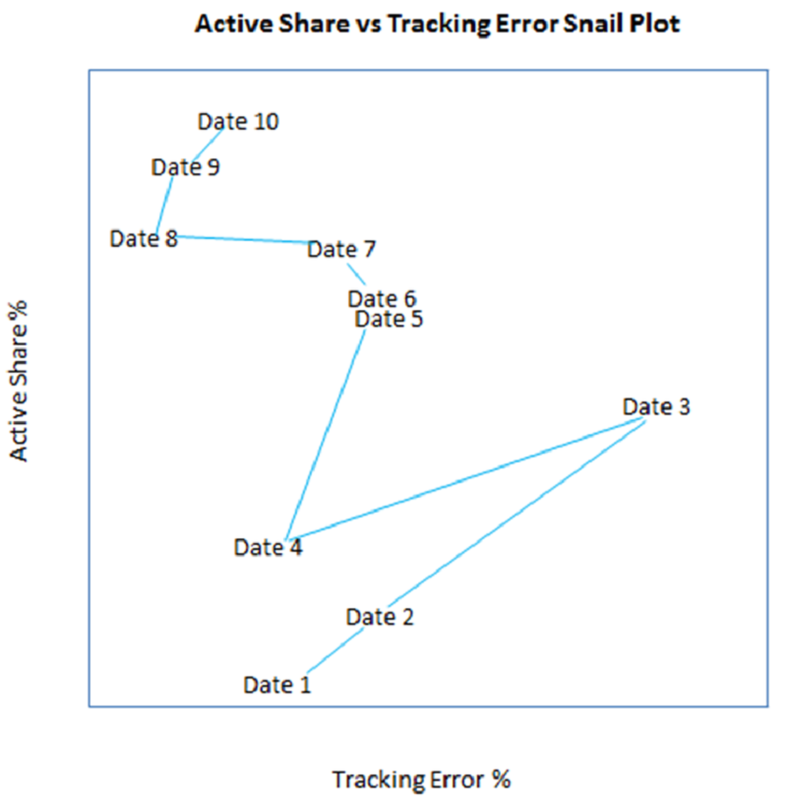 Active share (“AS”) must be considered alongside TE to assess how truly active a manager is. AS measures the degree to which a portfolio’s holdings differ from the benchmark. More specifically, it is the sum of the absolute values of a portfolio’s active weights (positive and negative), divided by two. Absolute values are used so that underweight positions (negative active weights) don’t offset overweight positions (positive active weights); the maximum of this sum can be 200% so we divide by 2 to ensure that AS is bounded by 0% and 100%. How should one interpret AS? A portfolio exactly the same as the benchmark has an AS of zero. A portfolio with no common holdings has an AS of 100%. In relative risk terms, therefore, the former portfolio includes no active bets whilst the latter is as different from the benchmark as it possibly could be. A 2009 academic paper by K Cremers and A Petajisto1 (since supplemented by Petajisto in 20102) increased the profile of AS significantly. Curiously, though the original was written at the Yale School of Management, it has been adopted more in Europe than in the US. Cremers and Petajisto argued and provided empirical evidence that, within their US mutual fund sample set, managers with a high AS tended to outperform funds with lower AS. We had been aware of AS for some time, but were impressed by the findings of this paper and some of the metrics and analysis within it. The conclusions of the paper also drew the attention of investors and other fund managers. 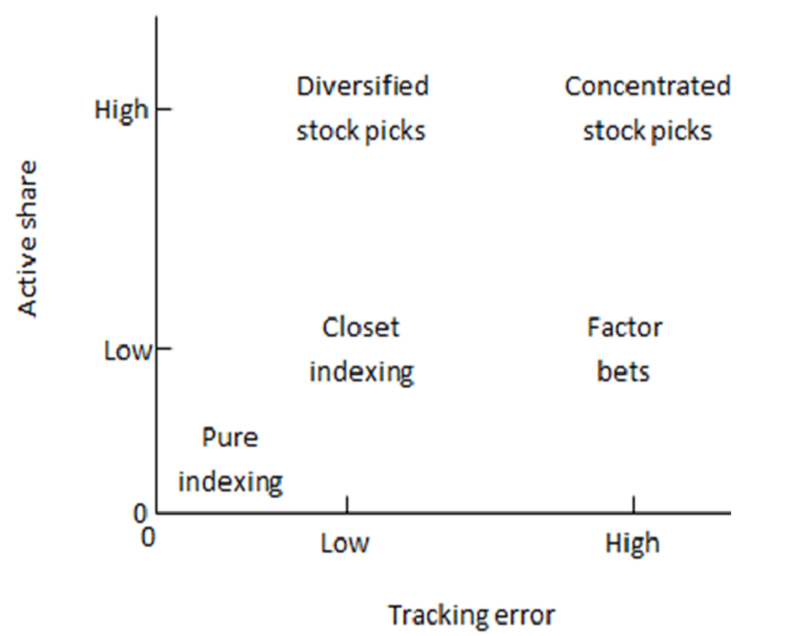 Using this framework, they define five types of portfolio management: (i) diversified stock picks with high AS and low TE; (ii) concentrated stock picks with both high AS and TE; (iii) factor bets with low AS and high TE; (iv) closet indexing with low AS and TE; and (v) pure indexing with intentionally very low AS and TE. They showed that diversified stock pickers produced the greatest outperformance; closet indexers consistently the worst. Why? Closet indexers are too similar to the benchmark to generate excess returns yet charge higher active management fees, thus yielding lower net performance. The key take-away is that an active manager can justify its fees only if it takes sufficiently active decisions relative to benchmark. 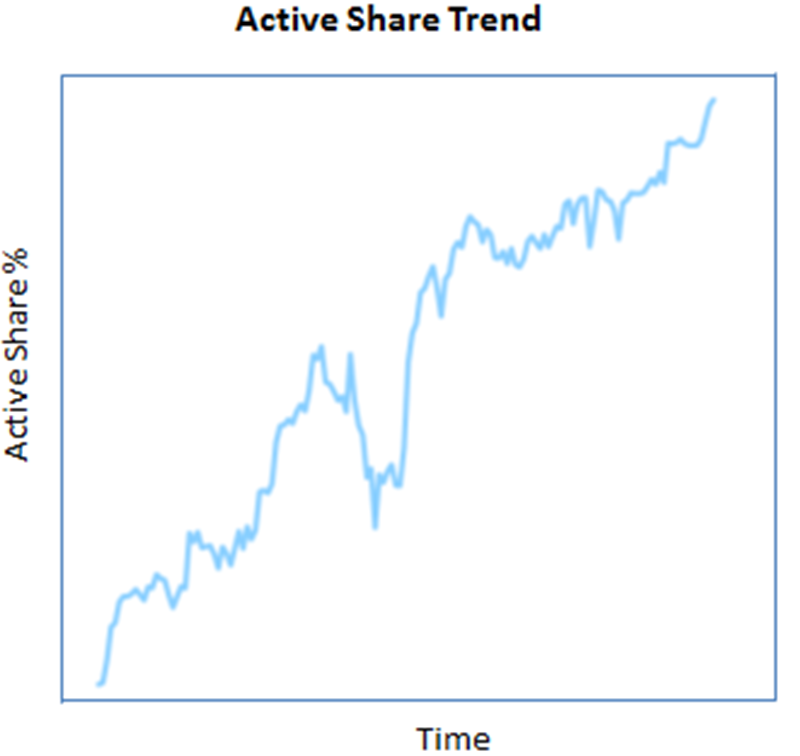 Within the spectrum of management from passive tracker funds to high alpha active funds, an investor is better off picking from the extremes, using passive products to gain broad factor exposure at low cost but supplementing this with high alpha “stock pickers” where the fees can be justified over the long term. Investors should avoid “closet indexers” who offer passive levels of performance at higher cost and therefore underperform the index. It is important to note that low TE alone does not necessarily indicate closet indexing. Investors should place greater emphasis upon AS to determine whether an active manager is delivering value for money. TE is the traditional risk measure for active portfolio management. It differs from AS in that it takes into account the covariance of returns between stocks and so puts more weight on correlated active bets. As such, high TE can arise from active factor bets, whereas diversified stock selection can allow TE to remain low. However, managers cannot directly observe the variance and covariance of stock returns; they can only estimate those values, usually by statistical analysis of historical price moments. Therefore, any measure based on such an estimate is susceptible to sampling errors and short term “noise” effects of changing market volatility; and from the possible deviation of future statistical relationships from past ones. AS, on the other hand, is a far simpler metric to compute as it only requires weights for the portfolio and benchmark for a single point in time. Unlike TE, stock covariance (correlation or volatility) is not taken into account, so the measure makes no prediction of expected volatility. Although Cremers and Petajisto suggest an arbitrary AS level of 70% that active managers should stay above, we believe the measure needs to be normalised to enable valid comparisons to be made across funds with different mandates. The choice of benchmark can be significant, particularly where an index is highly concentrated. To illustrate this point, as at 30th October 2013 an equally weighted portfolio of the top 40 stocks by market cap in the MSCI EAFE index would produce an AS of 67%, whereas the same construction rule applied to the FTSE All Share would record an Active Share of only 43%. Even though Cremers and Petajisto carefully adjust for factor effects of Size, Value, Momentum and Markets (using Carhart’s Four-Factor Model), investors should be aware that a preference for small-cap over large-cap will tend to generate higher AS, and likewise favouring large-cap is likely to reduce AS. The use of AS fits nicely into TT’s principles of risk management. We consider risk management not to be solely an art or science, but a careful blend of the two; we avoid relying on any single risk metric and favour using a range of quantitative and qualitative techniques. We also track risk metrics over time to analyse their relevance over different performance and market cycles. In their paper, and indeed as one might expect, Cremer and Petajis give credence to both AS and TE. We also use the two in tandem to help understand the risk profile of a portfolio and stay true to our principles. For all risk metrics have their strengths and weaknesses. Rather than champion or dismiss any one of them, we prefer to understand their limitations and the conditions under which those limitations are more pronounced. We know, e.g., that TE becomes less meaningful when there is a significant change in the levels of market volatility, either a general decline or a sudden spike. AS, on the other hand, is harder to achieve when a portfolio manager is positive on large cap names, since an overweight position in one of these utilises a significant proportion of the portfolio’s net assets. It can be further complicated when a benchmark is skewed by a number of larger companies representing a significant proportion of the benchmark; generating a high AS is again a challenge as all of these companies utilise the portfolio’s net assets. This explains the challenge in maintaining high AS in a portfolio benchmarked to the UK’s FTSE All-Share Index, as noted above. Chart 2 below is a typical piece of analysis conducted by our risk team and is discussed regularly in meetings with our portfolio managers. Although we do not explicitly set targets for AS, in the case above both the portfolio manager and risk team felt that AS had fallen to a level inconsistent with the targeted returns. AS was the mainstay of conversations regarding that portfolio’s risk levels and has increased by a very substantial 20%. We have found it useful to consider a two-dimensional framework relating AS to TE (Chart 1 on Page 1 above) and to plot our portfolios within this framework over time. Chart 3 is an example of this. We tend not to put scales on these charts. They vary significantly with portfolio benchmark, so there is no “right” answer. Rather, we concern ourselves with the general trend and direction. In this instance the portfolio clearly has moved from the bottom left quadrant (a level possibly dangerously close to closet indexing, depending upon the scale) towards the diversified stock picks quadrant. By keeping a close eye on analysis such as this we aim to ensure that we continue to deliver maximum value to our investors. In addition to discussing AS at the total portfolio level, we also consider more granular contribution to AS from sector and country groupings. Chart 4 below is taken directly from our standard risk reports and provides further data in our discussions with PMs. 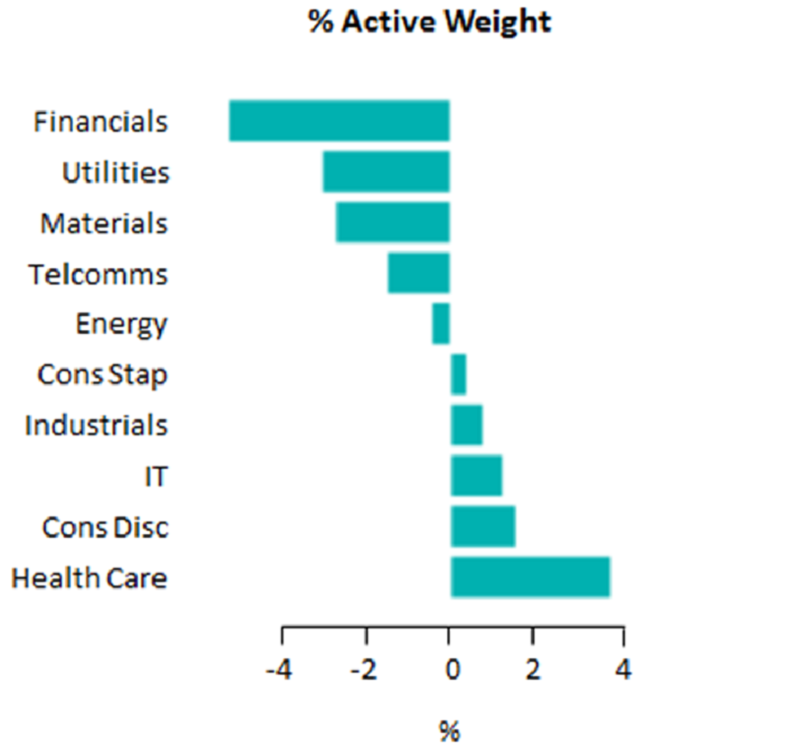 The graph below (Chart 4) is a typical display of active weights by sector showing the portfolio’s aggregate sector positioning. 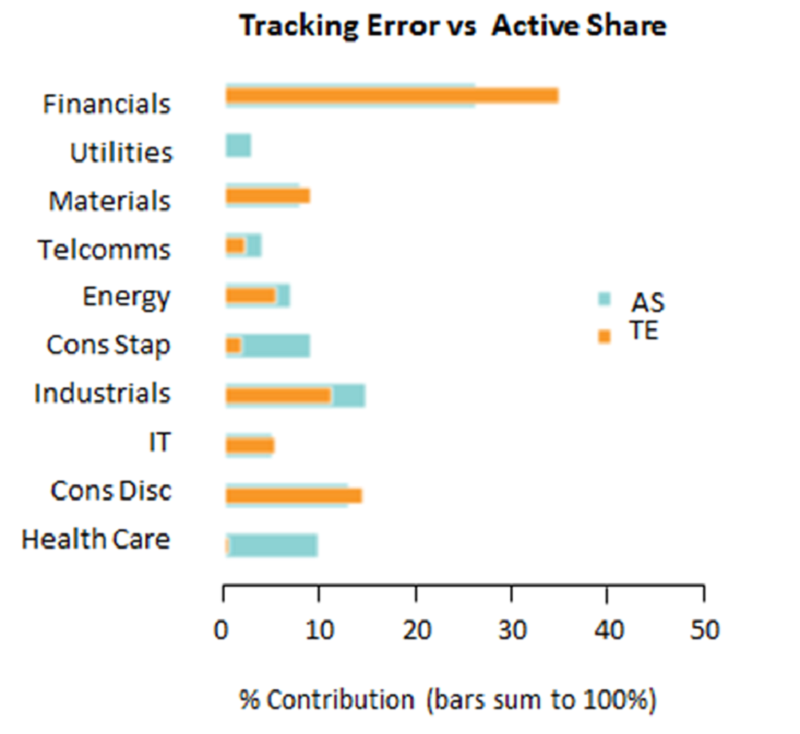 Plotted beside this is a graph of percentage contributions of TE and AS by sector. We find this graphic useful for a number of reasons. From it we can quickly identify the key risk sectors in the portfolio, in this case financials (which is using almost 40% of the risk budget). We are able to get a feel for whether the risk is directional in nature (i.e. a factor bet), or more stock-specific. And we are broadly able to compare the AS with the TE resulting from the PM’s active decisions. We do not necessarily expect these to be aligned. In fact, as previously discussed, a key difference between AS and TE is how they respond to volatility and changes in volatility. So part of the difference can be explained by differences in factor volatility. In this case, financials offer more TE per unit of active share than consumer staples, in part because financials are more volatile than consumer staples. Another way to look at this is as a measure of potential reward given the level of active decisions being taken; or as a measure of how much “bang” the PM is getting for his “buck”. We hold strong convictions concerning risk management, borne out by our detailed analysis and reporting supplied by our well-resourced and experienced risk team. This paper has discussed AS and TE; in fact, we find value in, and use, other risk measures as well. TE remains a valuable tool; indeed, under some conditions discussed in this paper, particularly so. But we also have found enormous value in considering AS, and it, too, comes to the fore under other conditions. Most important, we find the greatest benefit when considering AS in conjunction with TE. To this end, our portfolio managers give much consideration to AS during their regular meetings with our risk team.